Shortly after Christmas, and lost in the holiday shuffle, Turkish President and terrorist supporter Recep Tayyip Erdogan, made a statement accusing the U.S.-led coalition of supporting not only terrorists in Syria but ISIS itself. He also stated clearly that Turkey has proof that U.S.-led coalition is supporting the notorious terrorist organization it claims to be fighting. Erdogan also called on GCC members such as Saudi Arabia and Qatar to join Russia, Iran, and Syria in peace talks regarding the current crisis next month. He said these countries (the Russian coalition) have “shown goodwill and given support” to Syria. He stressed that Turkey would not take part in negotiations if “terrorist groups” like the Kurdish separatists were involved. Erdogan’s statement is actually true as Mark Toner and anyone who can operate a keyboard knows full well. The United States and its coalition have long supported terrorists in Syria, and both have done so since day one. That being said, Turkey and Erdogan specifically have supported the same terrorists for just as long. For that reason, Erdogan’s statements may appear startling if taken alone. Thus, the question now becomes – what is Erdogan’s purpose behind those statements? After all, Erdogan has remained stalwart in the NATO camp ever since the beginning of the crisis where he argued that Turkey only supported moderates, never acknowledging the fact that Turkey was buying ISIS’ stolen oil and providing jihadists with porous borders so that they could easily cross over into Syria. So why would Erdogan throw his NATO and GCC “allies” under the bus and actually spill the beans regarding Western/GCC support of terrorists? The answer is actually a number of possibilities. Some researchers may suggest that Erdogan’s stance is changing and that he is moving Turkey more into the Russian orbit, abandoning the NATO position of destroying Syria and, thus, beginning the process of dropping the U.S., GCC, and NATO baggage and exposing imperialists at the behest of the Russians. Others attribute his statements to the mere ravings of a madman lashing out at the slightest sign of criticism or political trouble. While these explanations are possibilities, the reality is most likely that it is a complex web of intrigue that centers itself around Erdogan himself and the position of the Muslim Brotherhood that has caused Erdogan to make such a statement. It appears that Erdogan is attempting to sit on the fence between two world powers and their alliances – the Western world hegemon and the Russian coalition – while, at the same time, trying to promote his neo-Ottoman vision for Turkey. While Erdogan was firmly within the NATO camp at the start of the Syrian crisis, it is quite likely that Erdogan has started to realize that chaos in Syria might very well equal chaos in Turkey and that U.S. support for the Kurdish fighters in Syria and Iraq might ignite Kurdish separatists in Turkey, throwing his own country into chaos and civil war yet again. Thus, Turkey has moved more toward the direction of Russia, despite having shot down a Russian jet and acting provocatively toward Russia in the past. Putin is, of course, using the carrot more so than the stick, a diplomatic strategy that tends to yield better results in the long run, particularly when the power bearing the carrot has a massive stick for backup. For that reason, Turkey is willing to at least provide token support to “peace talks” and other Russian-led initiatives. However, to suggest that Erdogan has actually moved into the Russian orbit is naïve. Turkey continues to keep its borders open for ISIS fighters to cross into Syria and it continues to maintain its “safe zone” area which is nothing more than a forward operating base and supply line corridor (the Jarablus Corridor) for ISIS and its related terror organizations. As previously mentioned, Erdogan has been willing to risk direct war with Russia on a number of occasions and the Turkish government has even announced support for terror brigades to be used on Russian territory, the Crimea. Erdogan’s neo-Ottoman dreams have become more and more obvious through his own statements, such as his vocal support for the Misak-Milli, a series of decisions by the Ottoman Turkish empire that saw Turkey claiming parts of Iraq, Syria, Armenia, Georgia, Greece, and Bulgaria. He has even suggested the possibility of doing away with the Treaty of Lausanne, which delineates the Turkish borders. Erdogan’s willingness to throw his GCC allies under the bus most likely is compounded by his Muslim Brotherhood affiliations, a slightly more moderate form of Islamic extremism that calls for a referendum in Saudi Arabia and the Gulf. It is for this reason that a rift exists between the Islamist Erdogan and the Wahhabist Saudis. For beginners, it is the equivalent of “Democratic” socialists versus communists. As Erdogan’s own plan of playing both sides continues, the situation inside his own country will most likely continue to deteriorate, despite his clever handling (or masterminding) of the recent coup that saw him eliminate many of his political and institutional enemies. As the domestic situation in Turkey worsens, Erdogan will likely face losses both in Syria and Iraq and will most likely move closer to Russia. As a result, the West will attempt to rein him in, using both the carrot and the traditional American stick. Domestically, his troubles may overwhelm him or, at the very least, the stability of his country. Erdogan is currently attempting a delicate balancing act between two world powers. Delicacy, however, is not what Erdogan is most skilled at. Regardless, it is important to remember that Turkey is still very much a part of NATO and very much a part of the anti-Syria, pro-ISIS coalition. His recent statements regarding the coalition support of ISIS is merely an attempt to bargain with the United States and gain brownie points with Russia, both designed to enhance his position for his own foolhardy neo-Ottoman dreams. With that being said, we should welcome Erdogan’s newfound honesty and encourage him, if he has the photos and videos he claims to possess, to release them to the media immediately. Brandon Turbeville – article archive here – is the author of seven books, Codex Alimentarius — The End of Health Freedom, 7 Real Conspiracies, Five Sense Solutions and Dispatches From a Dissident, volume 1 and volume 2, The Road to Damascus: The Anglo-American Assault on Syria,and The Difference it Makes: 36 Reasons Why Hillary Clinton Should Never Be President. Turbeville has published over 850 articles on a wide variety of subjects including health, economics, government corruption, and civil liberties. Brandon Turbeville’s radio show Truth on The Tracks can be found every Monday night 9 pm EST at UCYTV. His website is BrandonTurbeville.com He is available for radio and TV interviews. Please contact activistpost (at) gmail.com. Speaker of the People’s council of Syria, Hadiya Abbas, stated publicly that the Syrian Arab army intercepted calls between the US and Daesh just before the US raids against the SAA in Mount Altherdh in Deir Ezzor. The Syrian government said in related reports that it will make these intercepted calls public. Syrian foreign minister, Walid Muallem, stated that the US air strikes on Syrian military positions in the Mount Altherdh in DeirEzzor, were not accidental fast strikes, on the contrary they came in coordination with “Daesh”, who immediately invaded the military site command of Deir ez-Zor Airport after the airstrike. Muallem said in an interview with Al Mayadeen Channel that the US air strikes on Syrian military positions in the Mount Altherdh came in direct coordination with the “Daesh” pointing out that they were not even fast strikes, rather they lasted for 50 minutes. The current “level of violence in verbal attacks” on Russia at the UN is unprecedented,” Gilbert Doctorow, European Coordinator for the American Committee for East West Accord told Radio Sputnik, adding that this seems to indicate that something grave must have happened between the two countries with regard to Syria behind the scenes. The United States and Russia have lashed at each other over the Syrian conflict, with Washington and Moscow trading blows at the urgent UN Security Council meeting on Sunday. “We reached a new low,” the analyst said. Doctorow described the US’ behavior at the UN as “rude.” He also noted that such rhetoric has been absent from the UN Security Council meetings for decades. We have not seen “this level of open hostility and direct name calling” since 1985. Doctorow further said that the US-coalition airstrike on the Syrian Arab Army in Deir ez-Zor and the SAA resuming air raids in Aleppo are not sufficient to explain this level of verbal hostility. On Monday, Damascus said that the Syrian intelligence services have an audio recoding of communications between US forces and Daesh prior to Deir ez-Zor attack that claimed the lives of at least 62 Syrian servicemen on September 17. “It could be true, but it will have no implications because truth is the least of the factors on the playing field today,” the analyst noted. Doctorow recalled that the Western media did not cover the Russian Defense Ministry’s press briefing over Daesh’s illegal oil trade with Turkey. Ammunition and ‘Guns of Hell’: Rare Glimpse of Handarat Camp in Aleppo “That was dramatic. It was a fantastic demonstration. What was the result? Zero. There was no coverage in the Western press although all of NATO military attaches in Moscow were scribbling furiously and taking as many photos of the Russian flights as they could,” he said. The race for Raqqa – Could two world powers meet in battle over ISIS HQ? The Syrian military is quickly closing in on Raqqa, one of the last ISIS strongholds in the country, and is expected to reach the city within a matter of weeks or even days where a major battle between government and terrorist forces is inevitable. Recently, the Syrian military liberated a number of areas in eastern Syria near the Taqba airbase, another site that is expecting liberation in the next few days. The Syrian military has already reached the edge of Raqqa province. Raqqa has acted as the ISIS capital since the mysterious appearance of the group two years ago and has gone virtually untouched as the Syrian military has been bogged down in major cities and western/central areas of the country in their fight against the Western-backed terrorists. Notably, despite its rhetoric of fighting to “degrade and destroy” ISIS, the U.S.-led coalition has yet to bomb Raqqa. Fresh on the heels of a major public relations victory in Palmyra, however, the Syrian military is now marching toward Raqqa and, if successful, it will score one of the biggest victories in the five-year war. This is not only because the de facto ISIS capital will be eliminated or because the SAA will gain more territory, it is because the liberation of Raqqa will be yet another example of how the Syrian military will have accomplished in weeks what the United States and coalition members have claimed may take a decade to do. It will be another instance where the lack of will on the part of the United States to actually destroy Daesh is put on display for the rest of the world, either causing the U.S. to look weak in the eyes of the world or exposing it for actually supporting the terrorist organization to begin with. Regardless, the victory for the Syrian government will be twofold. That is, unless the U.S. gets there first . . . . The U.S. has been using the presence of ISIS in Syria as an excuse to bomb, send Special Forces, publicly support terrorists, and possibly invade since the Western-backed terror group appeared on the scene two years ago. Yet, despite its rhetoric, the United States and its coalition have not bombed Raqqa and have largely abstained from bombing (see here and here) any other terrorist group. 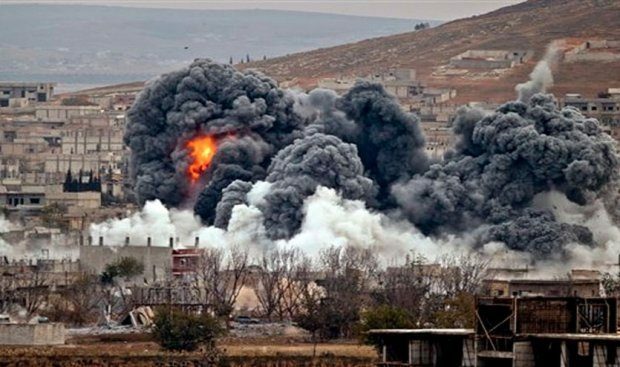 Instead, the U.S. has focused on bombing Syrian military targets, civilians and civilian infrastructure (see here also), and acting as a deterrent to the Syrian military’s movement in many “rebel-held” areas of the country. Now, however, the United States seems to have great interest in Raqqa as it aids its loose collection of terrorists, fanatical Kurds, and Arabs known as the Syrian Democratic Forces (SDF) in “battles” around the ISIS capital. So why the sudden interest in Raqqa? It’s fairly simple. The United States sees clearly that the Syrian military and its Russian allies are going to liberate Raqqa soon enough and the U.S. does not want to suffer another public relations setback. A defeat for ISIS is thus a humiliation for the United States. That fact alone should raise some eyebrows. Regardless, the United States would like to have its own “victory” in Raqqa before the Syrians and the Russians can have theirs. If the SDF is able to “take” Raqqa, the U.S. will then be able to shout from the rooftops that America has liberated Raqqa and defeated ISIS in its own capital. The U.S. also has another goal in Raqqa – the theft of more Syrian territory by using its proxy forces going by the name of the SDF. Whether or not ISIS proper is in control of Raqqa is merely a secondary concern for the United States. If the SDF succeeds in imposing control over the city and the province, then the West will have succeeded in cementing control over the area in the hands of its proxy terrorists once again, but with yet another incarnation of the same Western-backed jihadist fanaticism. The U.S. can then use the “moderate rebel” label to keep Russia and Syria from bombing the fighters who merely assumed a position handed to them, albeit through some level of violence, by ISIS. With the situation as it stands, there is now the very real possibility of some type of major confrontation taking place in Raqqa that could very well have international ramifications. On one hand, there is the Syrian military, backed by the Russian Air Force and Russian Special Forces heading East to Raqqa while, on the other side, there is the SDF, backed by the U.S. Air and Special Forces, heading West toward Raqqa. Both sides are in a race to gain control over the ISIS capital, gain territory, and declare a victory for the world to see. But what if they arrive in Raqqa at the same time? In other words, there is a distinct potential that, in the race for Raqqa, the Syrian/Russian alliance might find itself face to face with the possibility of direct military conflict with the U.S./SDF (terrorist) alliance. At that point, the question will be who, if either, will back down? If both forces decide to push forward, the result could be devastating not only for Syria but for the rest of the world. Regardless of what happens, it is important to remember that the Syrian military is acting entirely in self-defense both against the terrorists posing as “rebels” and the United States. Russia, Iran, and Hezbollah have all been invited in to Syria, acting legally and with the assent of the Syrian government, while the United States and its coalition are once again acting completely outside of international law in an attempt to shore up its terrorist proxies; and, once again, the United States and its coalition of the willing is pushing the patience of the rest of the world. Brandon Turbeville – article archive here – is the author of seven books, Codex Alimentarius — The End of Health Freedom, 7 Real Conspiracies, Five Sense Solutions and Dispatches From a Dissident, volume 1and volume 2, The Road to Damascus: The Anglo-American Assault on Syria, and The Difference it Makes: 36 Reasons Why Hillary Clinton Should Never Be President. Turbeville has published over 650 articles on a wide variety of subjects including health, economics, government corruption, and civil liberties. Brandon Turbeville’s radio show Truth on The Tracks can be found every Monday night 9 pm EST at UCYTV. His website is BrandonTurbeville.com He is available for radio and TV interviews. Please contact activistpost (at) gmail.com. Are US-backed Iraqi militias committing ethnic cleansing under the cover of fighting Daesh? Iraqi forces and affiliated Shiite militias are accused of ethnic cleansing and mass atrocities in Iraq, under the cover of fighting to liberate territory from Daesh. On Monday, the Iraqi Army announced plans to begin an offensive to retake the city of Fallujah from Daesh forces. The heavily-populated Iraqi city was the first to fall to the extremist group in 2014, but in recent months Iraqi forces have been able to sharply reduce the militants’ stronghold over the city. The city also played site for one of the bloodiest battles following the US-led invasion of Iraq, leading to mass casualties of US service members and leaving a once-prominent city in ruins. Following the ouster of Saddam Hussein, Fallujah, like many other multicultural cities in the country, descended into sectarian strife leading then-Senator Joe Biden to call for the partitioning of Iraq in 2006. The Sunni-dominated city faced the worst of the systematic effort to expunge loyalists of Saddam Hussein’s secular Ba’ath Party, in a process now known as de-baathification, from positions within the Iraqi government, including ordinary social sector positions in education, medicine, and engineering. The once prominent Sunni middle class found themselves the subject of persecution at the hands of the Shia-led government, and violent Shiite militias, notably Muqtada al-Sadr’s Mahdi Army. The widespread alienation of Sunnis and the repeated violent tides of ethnic cleansing by Shiite militias forced many secular Sunnis into league with the violent Daesh extremist group, whose Iraqi branch is now dominated by a cadre of former Saddam Hussein loyalists. With the government unravelling in Iraq, and the violent Mahdi army once again threatening to seize control of the country, the situation has been described as waves of ethnic cleansing by competing and increasingly extremist sectarian militias – the Mahdi Army, supported by Iraqi forces on the Shia side, and Daesh, along with al-Qaeda, on the Sunni side. In this descent into social cataclysm, the Iraqi army, along with loosely-affiliated Shia militias, looks to ‘liberate’ Fallujah, using American weapons and support, but with many residents of the Daesh-occupied city fearing another violent round of ethnic cleansing. On Tuesday, Loud & Clear’s Brian Becker sat down with Iraqi-American and foreign policy analyst Raed Jarrar to discuss the latest offensive. Has the offensive on Daesh-controlled Fallujah begun? The foreign policy analyst observed that people remaining in Fallujah are frightened by the Iraqi forces and affiliated militias, who they believe will use the presence of Daesh as a cover for ethnic cleansing. What do they mean by ‘liberating’ Fallujah? Ramadi was ‘liberated’ but there was nothing left. Where should forces attack to get a handle on the unravelling situation in Iraq? Jaraa claimed that a more meaningful solution to the ongoing sectarian violence in Iraq and throughout the region, would be to focus on policies of division and persecution that pit groups against each other, likening the violence committed by Shia militias to that committed by Daesh, which he referred to as a similar force on the Sunni side. “The idea of getting rid of all these things will not include dropping more bombs on Iraq, it will not make the country more peaceful and it will not make these groups more moderate. It will actually make more death and destruction and that is what the US has been doing in Iraq since 1991,” stated Jarrar. Daesh is blocking Fallujah residents from leaving while the Iraqis demand that they leave – what will happen to the civilians? “This is a different analysis than you receive in the mainstream media that the violence is part of the medicine, part of the solution, and the US has to support attacks on Fallujah and Mosul because this is the way to get rid of the bad guys and liberate these towns,” explained Farrar. “That is not what is going on in the real world. In the real world this is more violence that has illegitimate agendas to displace more Iraqi and create more sectarian enclaves,” he said. Since complete international isolation of Islamists isn’t achieved, any military confrontation with ISIS would be inefficient. Meanwhile Middle Eastern terrorism gets support not only of Islamic countries but also of those ones that pretend to belong to European democratic community. Also this community seems to consider that relations with terrorist structures of such countries as Ukraine are a common thing. At any rate, neither Berlin, nor Paris, nor Rome have ever condemned Kiev or called to do away with the Dudayev battalion (an armed group of radical Islamists mainly consisting of Chechens but also including militants from other Caucasian regions, and some Ukrainians) or the Sheikh Mansur battalion (seceded from the Dudayev battalion, placed not far from the Mariupol city in south east of Ukraine). No one also demanded to eliminate either Hizb ut-Tahrir organization banned by the majority of civilized governments, the ultra-radical UNA-UNSO, or the Right Sector. However all those organizations have been openly fraternizing with ISIS and even blew horn about it until recently. The leader of the UNA-UNSO Dmytro Korchynsky and his Right Sector counterpart Oleksandr Muzychko succeeded in Middle Eastern bridge building. The first one thought that terrorists had been the only Kiev’s allies in its fight against Russia and called Islamists for ‘taking a good aim’ at Russians. The other one was one of a general connecting links between Ukrainian ultra-nationalists and Islamists and liked to vaunt of success in dealing with ISIS. They say that the information about sale of Israeli and Soviet missiles and allegedly nuclear weapons elements to Daesh leaked to mass media due to his excessive garrulousness. However, after his death (which has been considered no-coincidence — he was killed during Ukrainian police-involved shooting) the leaks to the media died out. Some people believe that all relations with Ukrainian group of ISIS and its Syrian leaders have been monopolized by power structures annoyed with public rodomontade of Muzychko and his ‘associates’. It is clear that there is no trustworthy information in this respect. This is just a buzz. But there is no smoke without fire. They say that regular (!) contacts with ISIS are under the jurisdiction the Verkhovna Rada MP and the Minister of the Interior’s adviser Anton Herashchenko (!) famous of his proposal to publish personal data of Russian pilots in Syria, so that the militants could have the opportunity to take revenge. Apropos, Ukraine being represented by the secretary of the National Security and Defence Council Oleksandr Turchinov occurred to be nearly the only state applauding the attack on the Russian Su-24M bomber by the Turkish Air Force F-16 fighter. By doing so Kiev has distinctly defined which side it’s been standing and whom it’s been supporting. The speech of Ukroboronprom Deputy Director General responsible for Foreign Economic Activity Denis Gurak that Ukraine and Turkey had reached agreement on joint projects in many fields of defense industry, in particular aerospace, aviation, armor sectors and boosting security and protection in the Black Sea waters refers to the same. 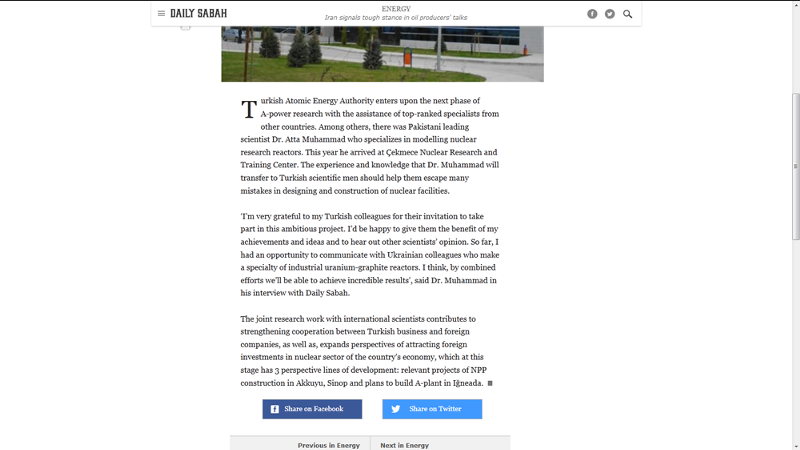 On top of that Ukraine has given Turkey all scientific resources in the field of nuclear research remaining since Soviet times. 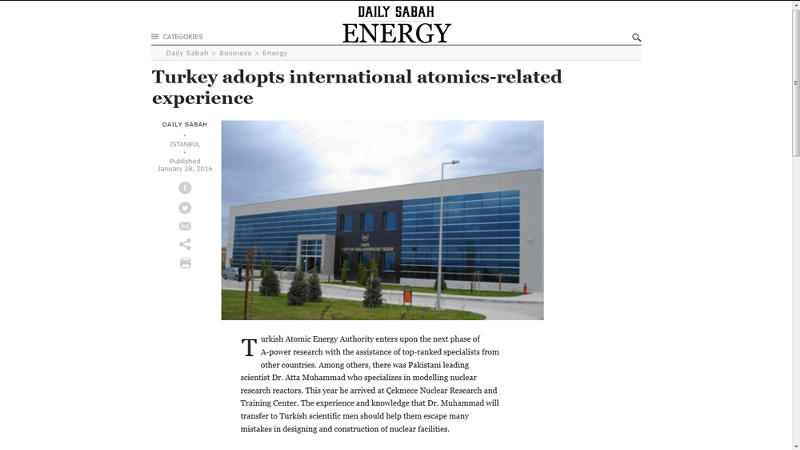 Thus Ukrainian engineers of carbon-uranium commercial reactors meant for production of weapons plutonium participate in research works organized in Turkish Nuclear Research and Training Center. In this way, Islamists can gain access to technology of making plutonium nuclear bomb through the agency of Turkey! It’s a remarkable fact that a representative of Syrian Turkomans Alparslan Çelik who is deemed to be responsible for the murder of the Russian pilot expresses thanks to Ankara and both ISIS and Ukrainian authorities as well in his appeal to Turkish government. His appeal was detected by Anonymous Group on one of Islamist sites نداء الى تركيا و داعش و اوكرانيا. There is every ground to believe that the alliance between Kiev and jihadists exists and that both sides have been actively engaging. For Ukraine, ISIS is a considerable leverage in its confrontation with Russia and an inexhaustible source of ‘black’ money at the same time. In particular ISIS supplies Ukraine with hit men from Turkey, Syria, Iraq and some former socialist republics for military conflicts in the territory of Novorossia. The most illustrative example of illegal export is a confession of the Kuwait ISIS group Osama Hayat of the deal to buy Chinese MANPADs FN-6 in Ukraine designed to engage low flying targets with maximum altitude of 3.8 km, which they conveyed through Turkey to Syria. The money was transferred through a Turkish bank. The Islamic State has also created several bases for terrorists’ training (according to various opinions, the largest training camps have been located in the Dnipropetrovsk suburbs and Perevalnoye place) and ‘recreation camps’, where it is possible to buy legal Ukrainian IDs. In the view of the visa-free regime for Ukrainians, those jihadists with new legal status obtain a very easy access to the Western countries. 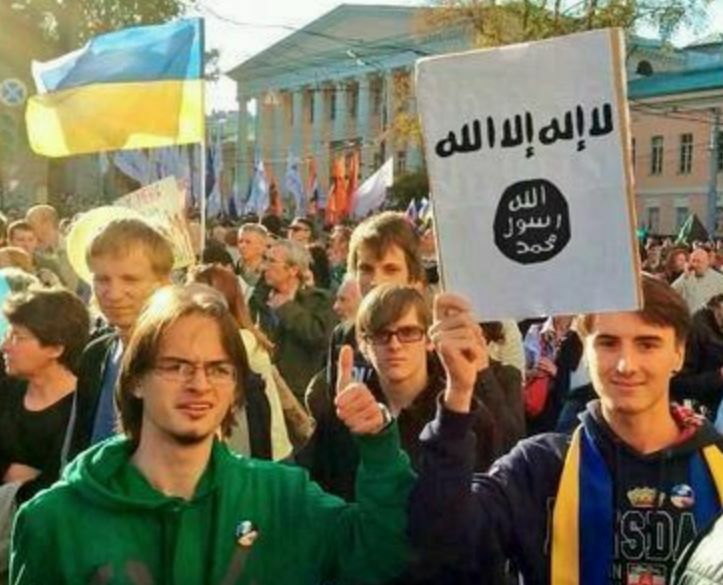 As a result, Ukraine turns into a terminal for Islamists in their way to Europe and transient center for committing acts of terrorism in Russia and other countries.